1. Fits both the LH (Driver's) & RH (Passenger's Side) Direct replacement light for factory installed lighting, Save time and money with a direct fit. 2. 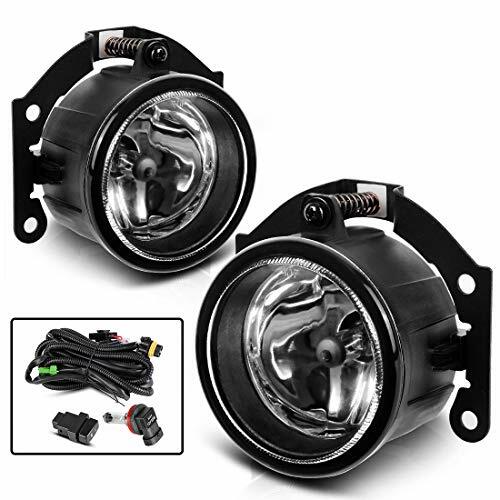 These fog lamps will install just as your original does. You can use your existing hardware and wiring harnesses. 3. Replacing a discolored, scratched, dull or damaged fog lamp with a fog light can help increase your visible. 4. A new driving light can provide you with up to 50% more illumination than a dull, yellowed, sandblasted, broken or scratched driving light. 5. A set of new fog lights can make you more visible to other traffic during heavy rain ,foggy, rainy, heavy dust, and snowy weather. 6. They generate a broad ray of light that allows you to see where you are headed, especially when driving under harsh weather conditions. 7. The lights are constructed from OEM grade ABS plastic to provide long-lasting and the most reliable service. Exact OEM Fit - Real glass fog lights for Mitsubishi Outlander (Pre-facelift) 2007-2015, Outlander Sport / RVR (Pre-facelift) 2011-2015, Mitsubishi ASX 2014. Provide a factory-installed look once mounted no vehicle modifications are required. If you have any questions about this product by AUTOSAVER88, contact us by completing and submitting the form below. If you are looking for a specif part number, please include it with your message.